As many of you know, I try to do something a bit different every once in awhile, stretch out a bit, take some aesthetic chances, maybe fall on my face. It’s good to be in a space you can fail, and not get too beat up in the fall. I started thinking about my influences from the art world way back when I was a younger photographer, and trying to figure things out; what worked, what didn’t, and how to get there from here. I always liked the surrealist painters, Rene Magritte, Salvador Dali, and Max Ernst. When digital photography really got going in the 90’s a lot of photographers started incorporating the surrealist style to their work, particularly, the style of the painter Rene Magritte. Magritte was great at the juxtaposition of incongruent objects into one image. (See Google Images.) I also admired the cubist Pablo Picasso and his way of seeing with a geometric vision, breaking his paintings into different geometric shapes, planes, angles, and dimensions. Digital photography and digital imaging done in postproduction captivated many photographers because it offered a way to escape the very thing that the camera was designed to do, that is, its ability to record scenes and subjects realistically. Digital imaging via programs like Photoshop unmoored, perhaps even unhinged, the camera from merely recording the scene it beholds. When photographers ask me what my favorite tool in Photoshop is, I tell them: “The restraint tool”. I also tell them that some of the best professional work in Photoshop is the work you can’t see. Of course all that is true, but in this particular project I was inspired by the thought that for each and every proposition there exists, logically, its opposite or negation. And so I thought: “Why not see how far I could go pushing digital imaging on the computer side as far as I could?” The source images I used in these homages to the aforementioned artists, ranged from very recent work I’ve done, to some photographs I had not thought about, or seen in quite awhile. I also did lots of different variations on each visual theme and sent out many different images and variations on each image to friends and colleagues. That felt good too, I didn’t have to settle on one image, but rather sent different ones to different people randomly. (The surrealists would have appreciated that!) So what else can I say? I had a lot of fun, frustration, and fear; always asking myself: “Is this far enough, or did I go too far?” “Ah there’s the rub”, as the old bard said, and is not a question I can answer reliably, although you, the viewer, surely will. 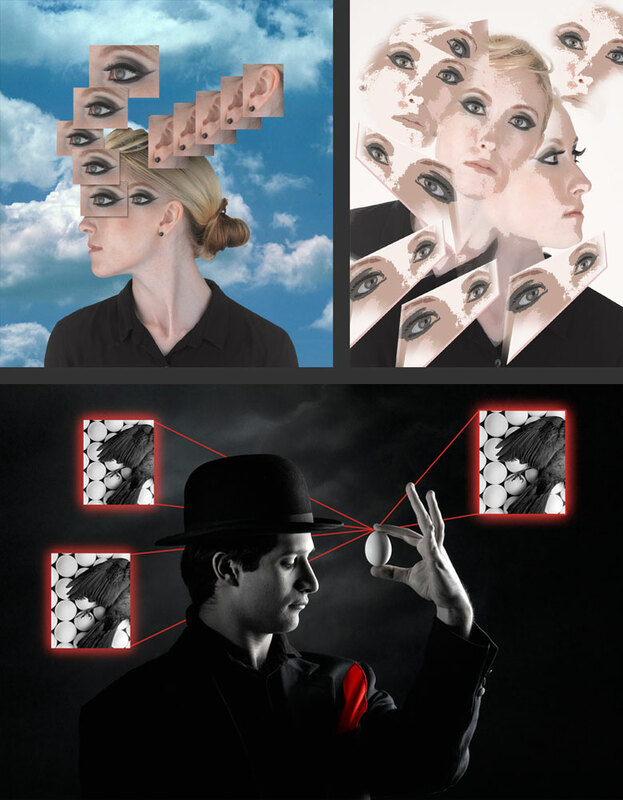 So that’s the story behind these images of photographs combined with photographs embedded in photographs, the best I can tell it.